With the start of the new academic year, the call to fill the posts of teachers, lying vacant in state government schools, grows stronger. The Department of Public Instruction puts out a list of vacancies and invites applications for Karnataka Teacher Eligibility Test (TET), and lakhs of candidates appear for the exams. In what is a shocking reality, just around 10% of these applicants manage to clear the entrance test raising questions about the quality of teachers and their employability. The candidates then protest and the department bowing down to pressure, relaxes the qualification norms and recruits teachers into government primary and higher primary schools in the state, thereby compromising quality. For someone observing the process closely, this is a routine every academic year. In 2018, as many as 2.39 lakh candidates appeared for the TET conducted by the Karnataka government to fill the 10,000 posts lying vacant in government schools across the state. A mere 3.98% of the candidates cleared the test for primary school teachers and 16.89% cleared the test for middle school teachers. The tests mandate getting an average score of 55%. The average pass percentage has been less than 10% over the last five years. Common Entrance Test (CET) was introduced as a double check mechanism in 2017 to ensure that the quality is maintained. Every year, not less than one lakh candidates appear for the test. Those candidates who have a degree in arts or science and have completed their Bachelor of Education (BEd) are eligible to apply for these posts. Prospective teachers have to clear two rounds of tests to be eligible for the posts. The first is the TET which tests the subject knowledge of teachers. This is an objective paper. Candidates ought to obtain between 60 and 55% in TET, based on their category. Those deemed eligible can appear for the next round — CET, which has knowledge-based questions and is part objective and part descriptive. There is a constant demand from the candidates to give them relaxation in the qualifying percentage in TET. Even this academic year, there was a demand from the Hyderabad Karnataka region association of candidates that a “grace” of 15 marks ought to be given as the number of posts lying vacant in that region was higher. Experts blame the institutes that train these candidates and claim that even as BEd colleges across the state train several lakhs of prospective teachers, their quality and employability is questionable. “The syllabus for BEd was revised two years ago. When the Higher Education Council felt a need for quality education, a committee was constituted comprising deans of various universities. A framework was decided upon to meet the present-day needs. The problem, however, lies with implementation,” Raghavendra P K, a lecturer at Government College of Teacher Education, Belagavi, said. While a few universities accepted the suggestions of the expert committee to adopt a new syllabus, a few others cited autonomy and wanted to be excused, he said. Even with the few universities that have taken the expert recommendations into account, it has not been entirely implemented, he explained. The revised framework emphasises on practical knowledge. However, not all universities offer such course, Raghavendra said. “It roots down to teacher educators. They are the ones who train BEd candidates. It is unfortunate that these educators themselves are not up to the mark. They are given no orientation after a change in syllabus. Refresher programmes ought to be conducted for educators to keep them abreast with the latest industry demands. This is not happening,” he said. Raghavendra says that with educators unable to upgrade to present day needs, the BEd candidates that they train struggle to pass exams having application/ skill based questions. “Perspective courses are largely ignored,” he added. Prospective candidates, however, have a different perspective to offer. Tholi Bharamanna, state coordinator, Vidyarthi Bandhutva Vedike, says that there is no transparency in conduction of the entrance exams. “To begin with, we have been told that we cannot raise questions against the TET. After we take the test, there is no chance for us to take a look at the paper that has been evaluated. It is mentioned in the notification that no grace marks would be given nor will there be room for revaluation,” he adds. Bharamanna believes that this is unfair for candidates. "If there are mistakes in the question paper, then grace marks ought to be given. But there is no room for it,” he said. The candidates are of the opinion that there could be an ulterior motive behind this. “The government does not wish to fill the posts. Paying salary for 10,000 members is not an easy task. Hence, they have various regulations to ensure minimal number of candidates qualify,” Bharamanna added. Another candidate who did not wish to be named explained, "This is also indirectly an attempt to help private schools flourish. If government schools do not have subject teachers, the quality does not improve. Hence, private schools are preferred even under Right To Education (RTE)." "We also suspect that a deliberate attempt is being made to fail us in the examinations to run an extortion business. If not many pass, some on the borderline can pay higher officials a certain sum of money and get their marks increased. This is another intention why the papers are made tough,” the candidate said. Officials in the department, however, denied this. There have been protests by candidates seeking a relaxation of norms. In 2018, norms were introduced mandating a certain cutoff percentage in the TET to ensure quality. The department also saw the need for the introduction of a descriptive paper to ensure that it is not just by fluke that candidates clear exams with objective type questions. This was followed by protests as just 5% of the candidates qualified. In July, the department was forced to scrap a mandatory percentage rule which also led to protests by candidates who had performed better. An official in the department explains,"This had to be done as all the posts would have remained vacant otherwise. It was also discussed in the assembly sessions." P C Jaffer, commissioner, department of public instruction, blame the quality of education for the poor pass percentage. “TET is a BEd level paper while CET ideally has to have degree level questions. We are, however, only giving PU level questions,” he said while adding that questions have been picked from textbooks of Class 12. Candidates must clear both these exams to be eligible for the post. Previously candidates had to take just one exam. “Last year, we found it difficult because a certain cut off was made mandatory. We also introduced CET to ensure quality is maintained,” he said. Previously, the department was under political pressure to have candidates pass and overlook certain malpractices, a senior official in the education department confessed. 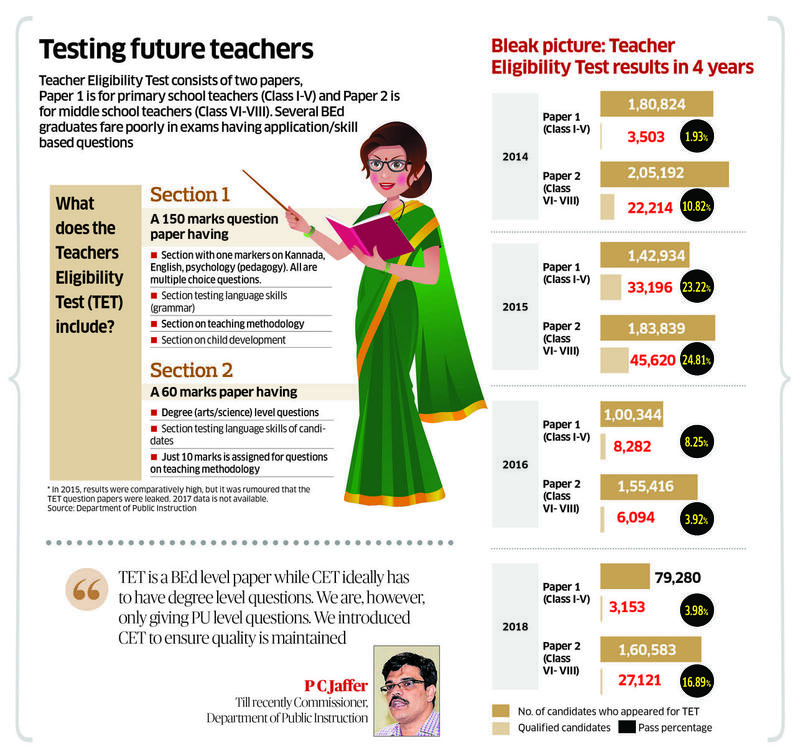 “If you notice, 2015 is the only year when the pass percentage in TET was reasonably high. This was the same year when it was rumoured that TET papers were leaked. An inquiry was carried out but nothing came out of it,” the official added.